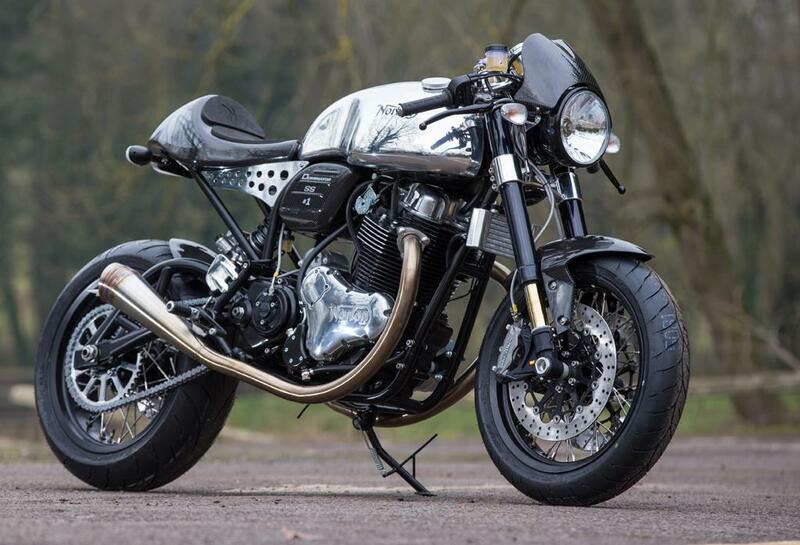 This is the world’s first sight of the fully road-legal version of the new Norton Dominator SS, which will be officially launched this weekend. There are two versions of the Dominator. Both are road-legal and compliant with Euro3 emissions rules, but they differ in terms of specifications. The top-of-the-range and limited-edition SS model you see here will cost £24,500 and the standard bike will be £19,950. 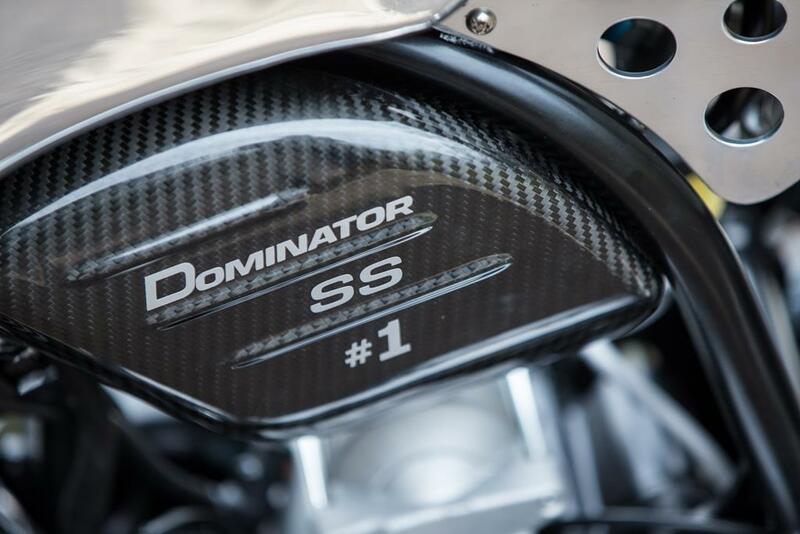 The Dominator SS shown here will be limited to just 50 UK bikes, but the standard bike will be an ongoing production model with significant changes to reflect the lower price. “We have been asked so many times to make this bike but we needed to make sure we were able to do it in a way that keeps existing Domiracer owners happy,” added Garner. The dilemma was to find a way of satisfying demand for a bike like the Domiracer, but without affecting the ongoing value of the 50 Domiracers sold last year. 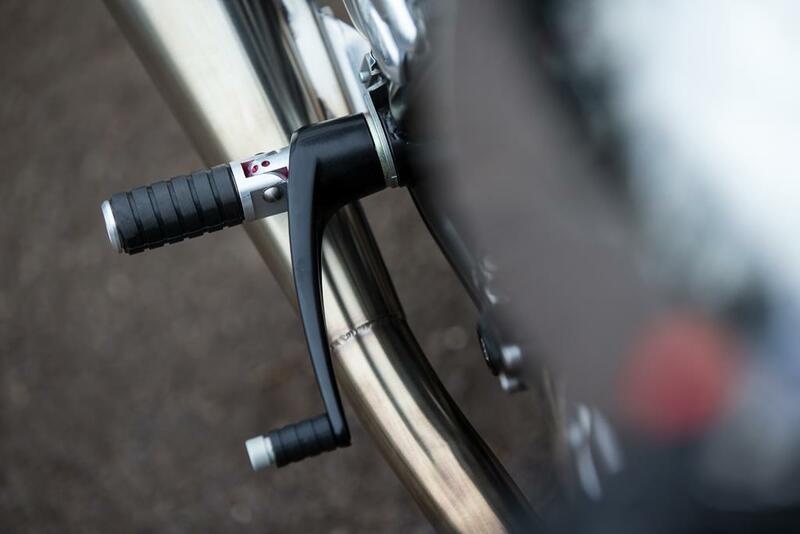 Last year’s limited run of Domiracers sold out in a matter of days, despite a £25,000 pricetag and each bike needing to go through Single Vehicle Approval (SVA) before it could be used on the road. 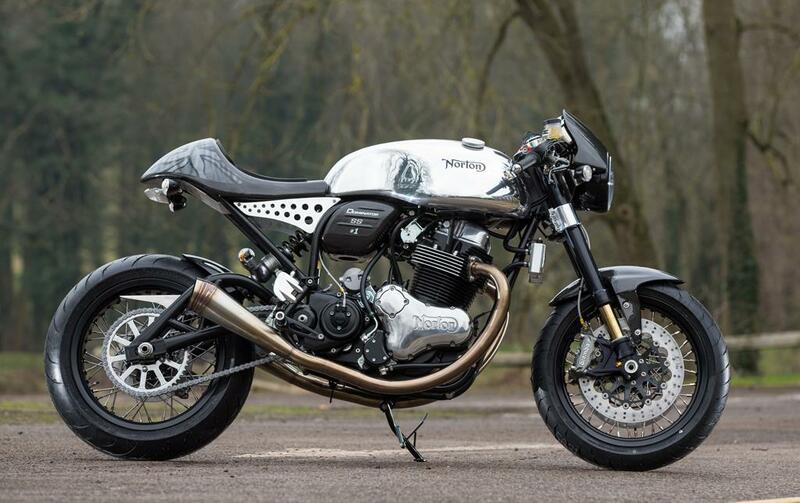 If Norton released another batch of Domiracers it would hit values of the existing 50, hence Norton creating these models instead. 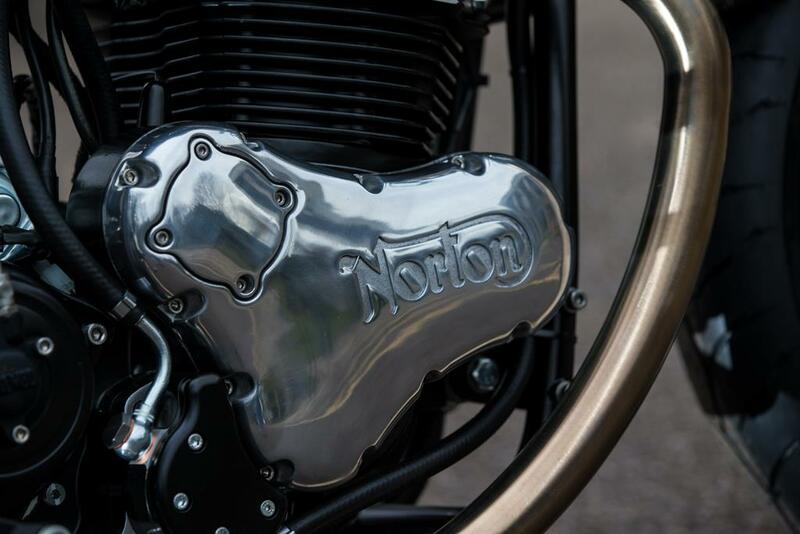 MCN was the first to show computer-generated images of the Dominator SS in December, when Norton’s design team gave us a sneak preview, but this is the first time a completed version has been seen in the metal. 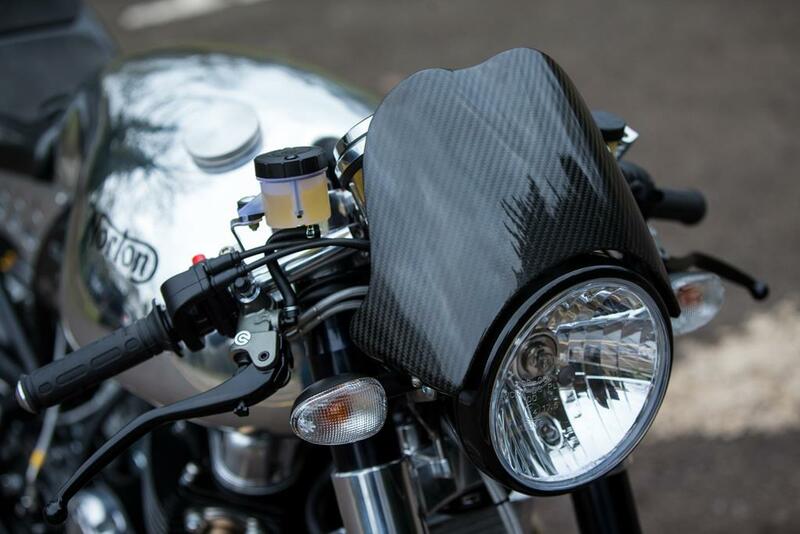 The bike will be officially launched at a special event this weekend at the firm’s Donington Hall headquarters. 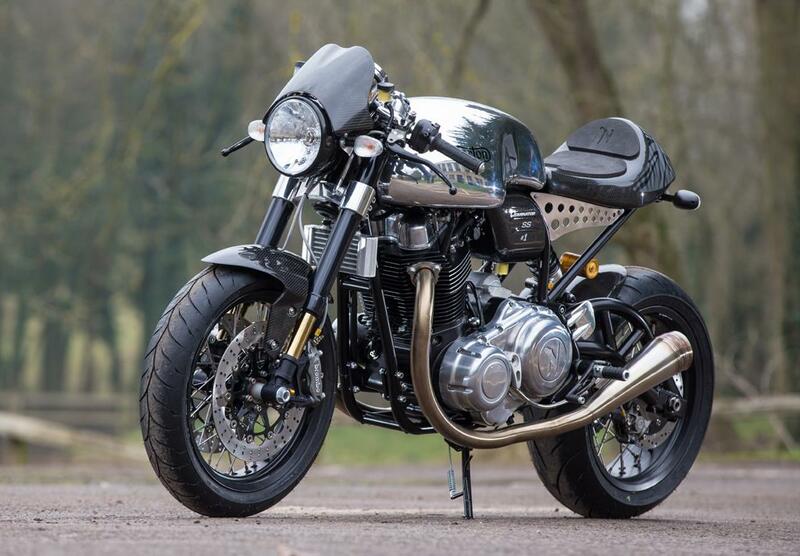 This bike uses the 80bhp 961cc air-cooled, parallel-twin, two-valve motor from the Norton Commando 961 model, but in a frame created especially for the Dominator. 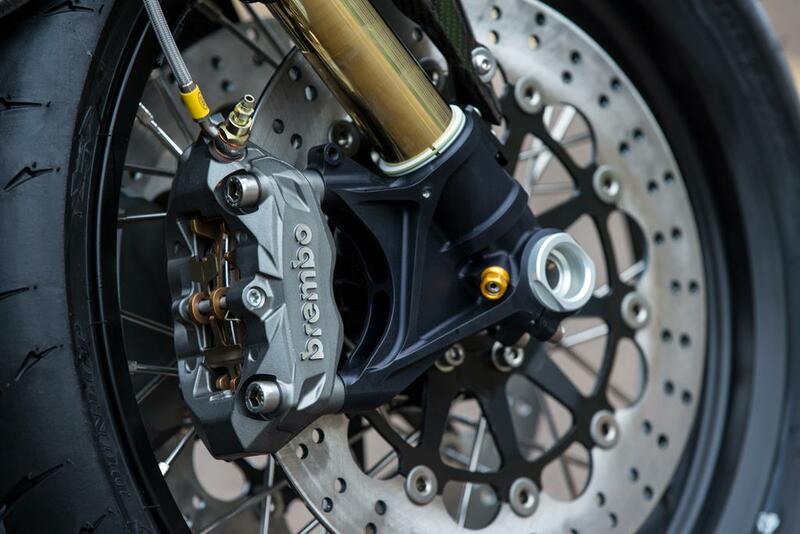 This ‘featherbed’ style frame is mated to the trellis-style swingarm, as on the Domiracer. 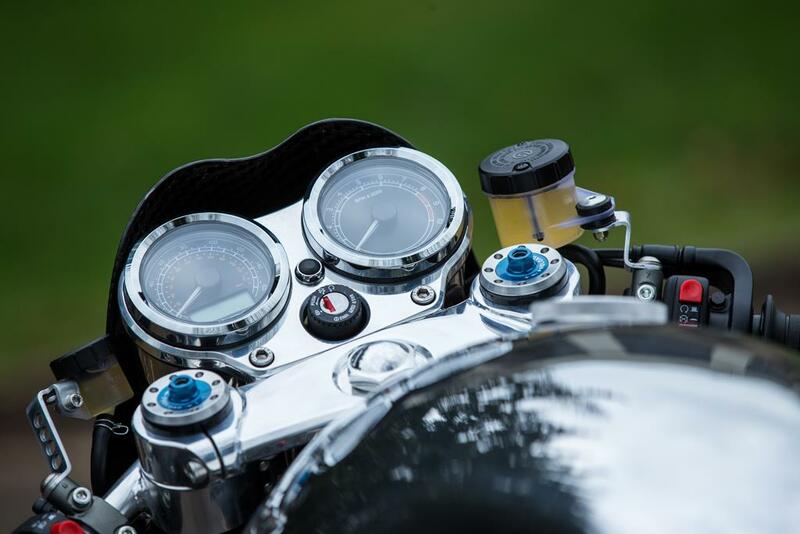 One key change from the Domiracer is the removal of the hand-rolled 1.5mm thick aluminium alloy fuel tank in favour of a much cheaper painted fuel tank, similar to the one used on the Commando road bike. An alloy tank will be made available but only as a £1700 factory option. 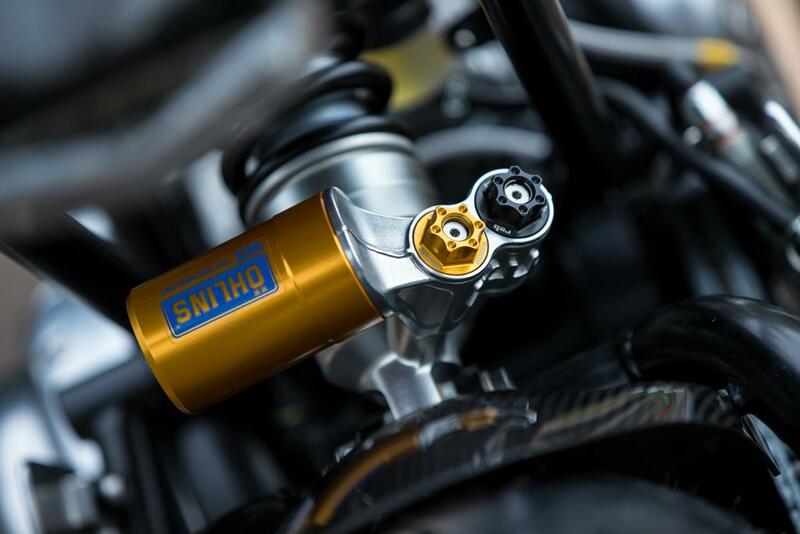 Other changes designed to reduce costs involve the replacement of expensive – and time-consuming-to-produce – parts like the yokes and heelguards, which were all CNC-milled billet items on the Domiracer. 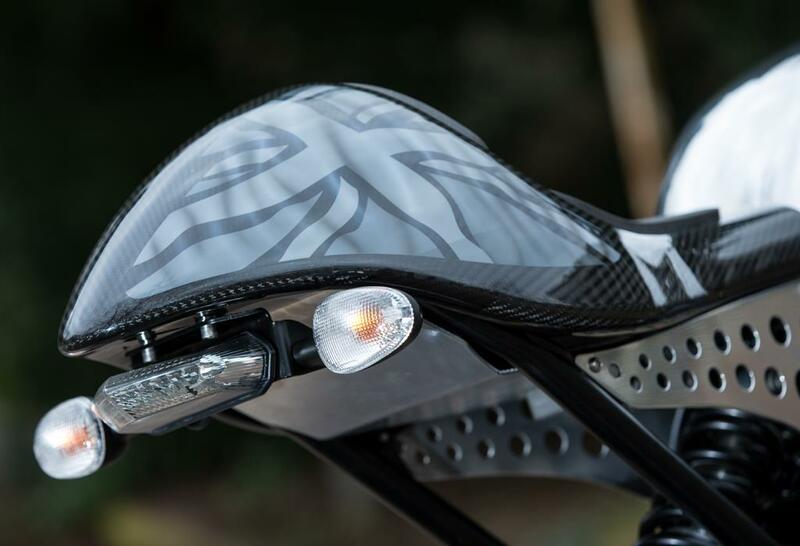 The Dominator also gets a small carbon-fibre flyscreen and different front mudguard, also made from carbon, in place of the Domiracer’s, which featured a hand-crafted metal support. The limited edition SS model does get the stunning hand-rolled 1.5mm thick aluminium fuel tank included in its price, and also gets straight-through megaphone-style twin exhausts. 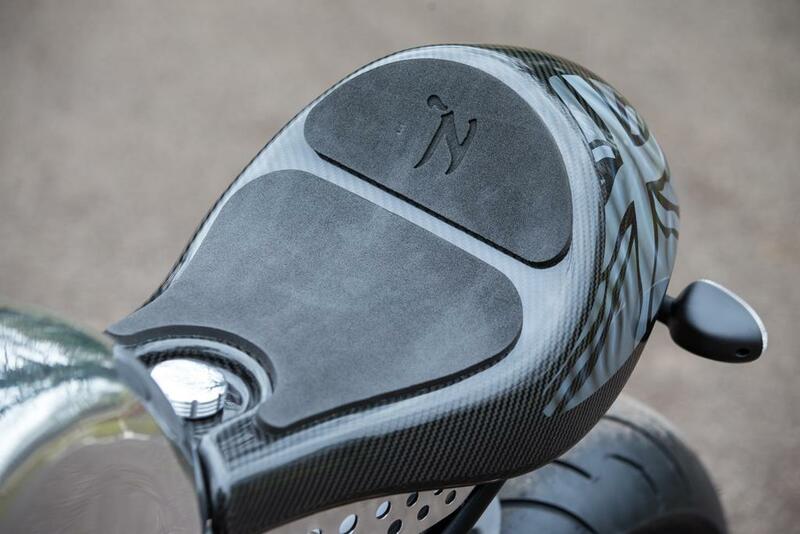 Both bikes will leave the factory with road-approved and noise-compliant exhausts, with the megaphones being included in a supplied ‘race kit’ for the SS. 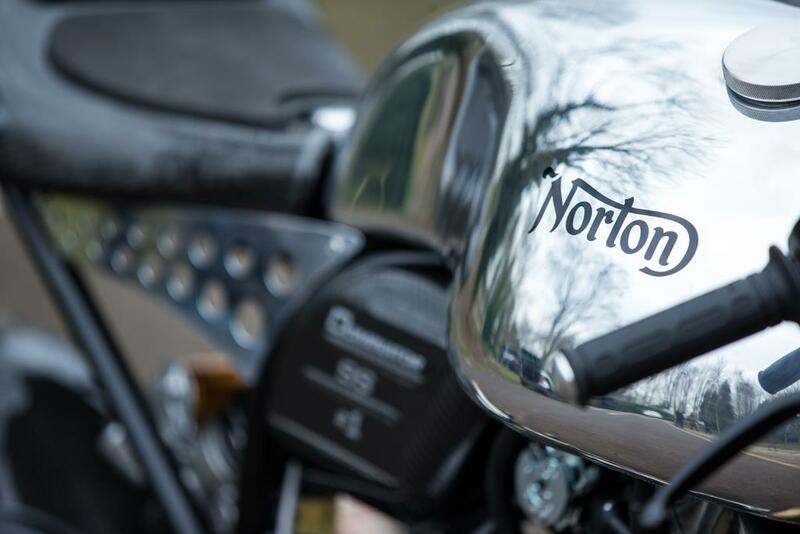 Read a world first test of the new Norton Dominator SS in the February 4 edition of MCN.